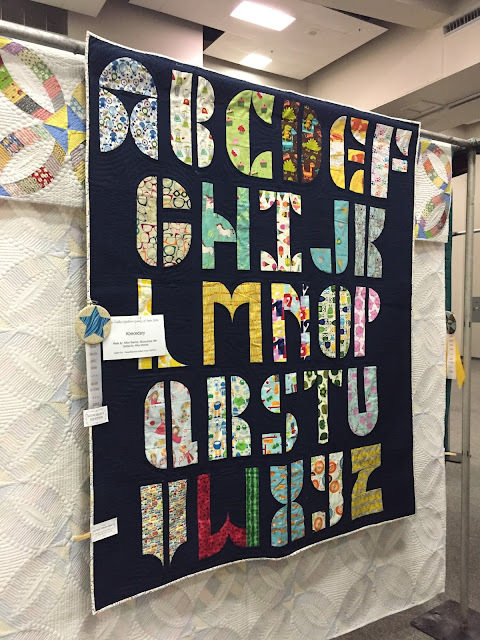 Previously, I showed you some of my favorite entries in the Galaxy of Stars Quilt Show hosted by the Pecos Valley Quilters in Roswell, New Mexico. Today, I'm going share my entries and how they fared in the competition. You may notice I have quite a few. I hadn't found a specified number of quilts that you were permitted to enter in the rules, so I entered 7 quilts in hopes of having something admitted. I was caught by surprise when I received an e-mail stated which categories all of my quilts would be in. Then, I began to have misgivings about shipping costs and the fact that six of my quilts didn't have sleeves or labels. I used Libby Lehman's sleeve instructions, and got to work, vowing to change my sleeve-neglecting ways in the future. Fortunately, shipping only cost about $15, and all the quilts made it to Roswell intact. 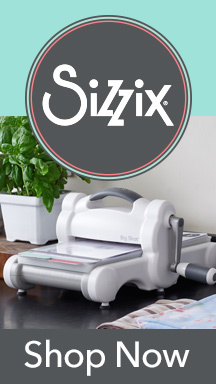 For those of you who ship quilts, do you insure them? I figure, without an appraisal, even if my quilts were lost in transit, I'd only be reimbursed for fabric costs in the unlikely event that I could locate corresponding receipts. Visions of Acoma was my best performer, earning first place in the Individual Wallhanging category sponsored by Classics Frozen Custard. 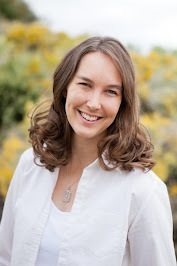 NQA Certified Judge Valerie Boman commented, "Bold graphic design is very effective. Fabrics are perfect. Quilting designs well-chosen and nicely executed. Some slight shadow-through noted. Corners should be square and crisp." I enjoy eavesdropping on others as they view my quilt. The ladies peering on said, "Wow! Afton, huh?" Sounds like a man." Um...nope! He he. 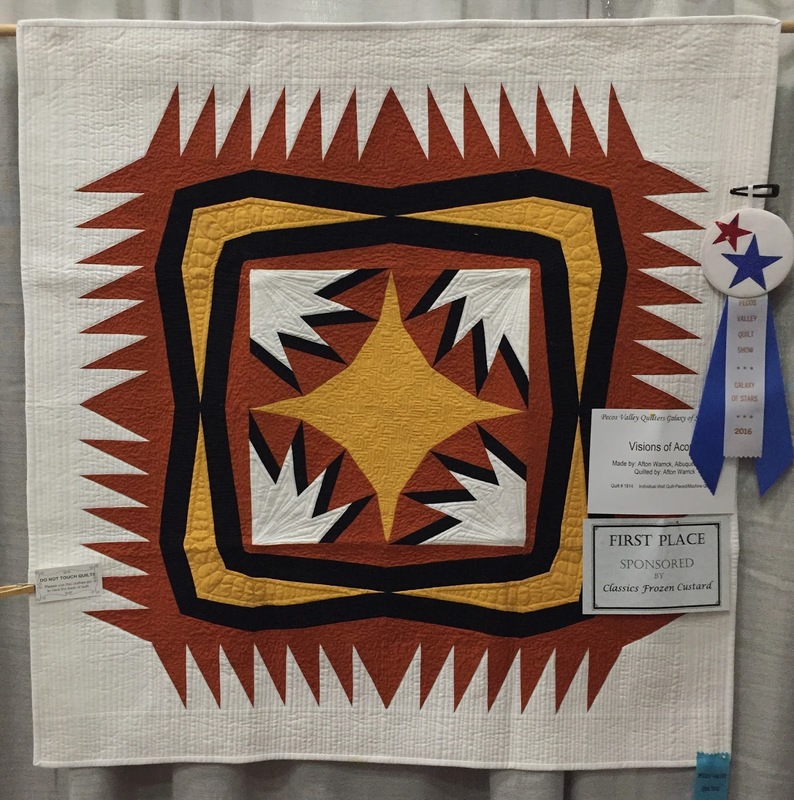 Palisades, which was quilted by Tisha Cavanaugh of Quilt Icing, took second in the Pieced/Machine Quilted Twin category sponsored by Farm Bureau Financial Services. Valerie stated, "What fun fabrics! 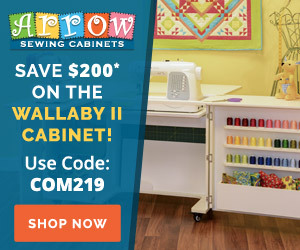 Very nice machine quilting (quality and choices). 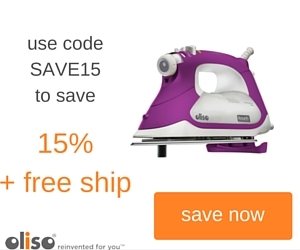 Your quilter did an excellent job!" Fractal was the recipient of an Honorable Mention for the Machine Quilted Throw category. It was also quilted by Tisha. "Soft, eye-pleasing color palette," mentioned Valerie on the evaluation form. Starburst did not earn an award, but it needn't feel bad, because I love it anyway! 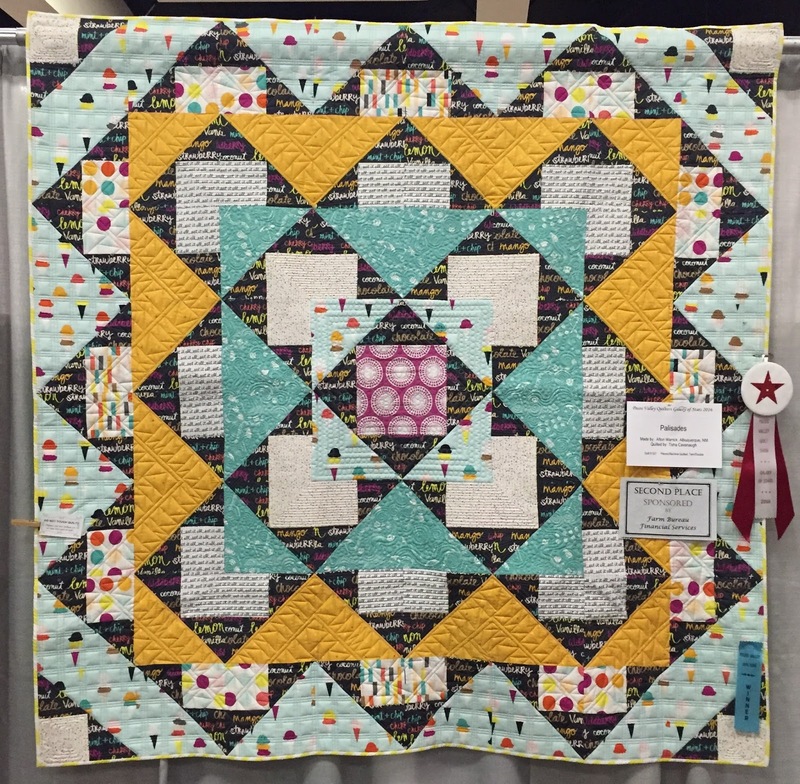 Judge's comments included, "Quilting designs were well-chosen. Fabrics bold and fun! Binding could be more secure. Outside edges should be straight. Quilt is not square." Solar Runner earned Honorable Mention in the Individual Wallhanging category. "Fabrics work so well together. Value placement is perfect. Excellent quilting choices. Strive for more even stitch length. Binding should be more secure," noted Valerie. In my six-year-old son's opinion, Abecedary earned the highest honor, as it was included on the scavenger hunt for kids. 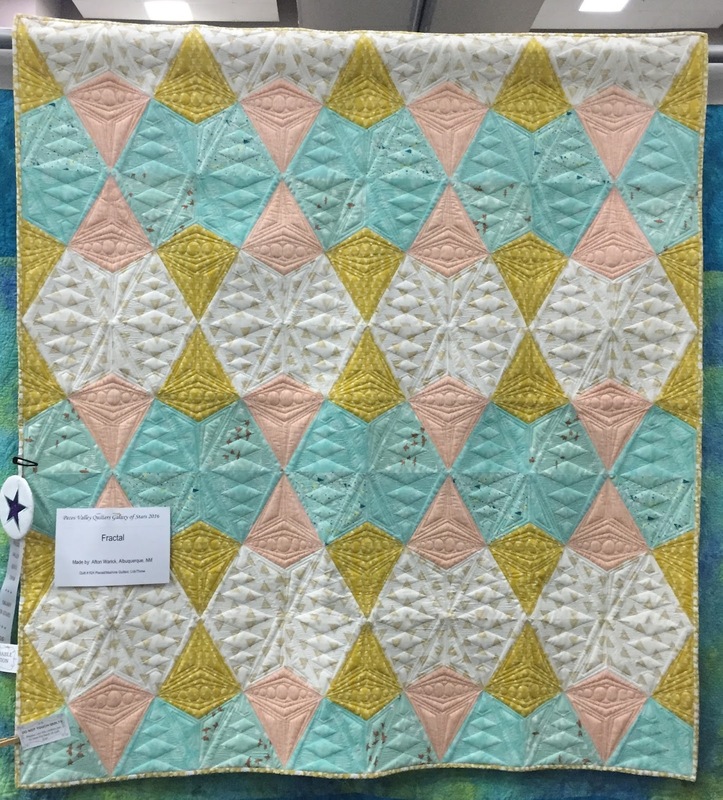 It also brought in an Honorable Mention for Pieced/Machine Quilted Group Throw, except I was the only one who worked on this quilt, so I'm a little confused. "Each letter's fabric is perfection! Echo quilting was the perfect choice for this quilt. Great binding fabric. Some quilting (possibly small meandering) would reduce puffins in letters," commented Valerie. It was really fun listening to the crowd try to figure out what each fabric represented. J is for Jupiter is probably the trickiest. This will be available as a pattern soon. I am very grateful to Tiffany at Always Sewin' Somethin! for testing the pattern and offering very useful input. Economy Plus was awarded an Honorable Mention in the Miniature category. 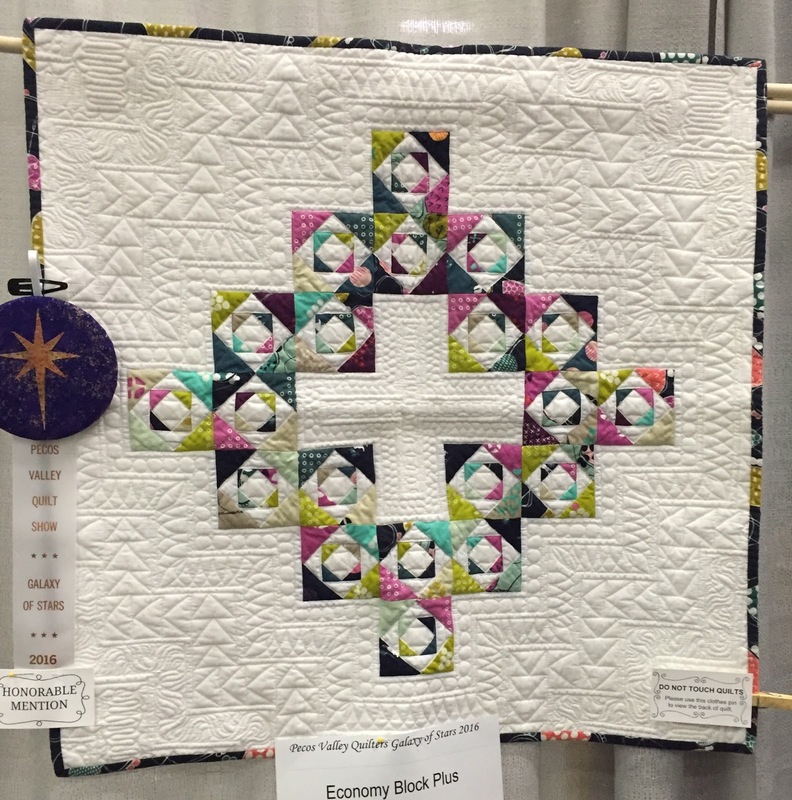 Valerie noted that the quilt's best features were, "contrast, fabrics, quilting decisions." She also mentioned, "Outside edges should be straight and corners square." In the future, I should sew sleeves on right when I finish quilting. It would also benefit me to block my quilts and stabilize the outer edges with twill tape. Maybe I just want an excuse to buy a 90 degree laser level. If I put it on my Amazon wish list, my husband might even be surprised when he receives it as a Christmas gift from his parents. Ha ha, that's what they get for making assumptions based on gender stereotypes! My husband won't mind; it'll save him buying me one. What will you be putting on your husband's wish list? Just kidding. Do you have any go-to squaring up tutorials, as my asymmetrical finishing techniques are undervalued? 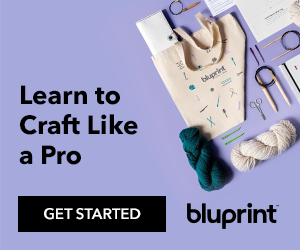 For quilts I plan to show, I block them before binding and use either a carpenter's square for the corners or a square ruler to make sure that I get a crisp 90 degree angle. How awesome that all your quilts were accepted. I do tend to insure my quilts when they ship and just cross my fingers I don't have to argue WHY they were insured for so much. Although, I do keep records of my time and material costs, so I do have some backup. Congrats on all your awards; your work is beautiful! The show, or whoever makes them, did a nice job on the award buttons too. I know nothing about blocking quilts (I'm pretty much a beginner at quilting), but I am interested in your mention of using twill tape to stabilize the outer edges. I'm not familiar with that technique. Beautiful Quilts and quilting. I've enjoyed seeing all the quilts you've photographed for the shows and think it is awesome that all of yours were accepted in. I've blocked small wallhangings, but not larger quilts and don't think I have a place large enough to do that. Let us know how the Christmas gifting works out so we can all follow suit. I finally got a laser square this year to use on larger quilts! I have spent a crazy amount of hours trying to use a carpenters square and various other rulers squaring bed sized quilts and usually just end up going crazy. Anyway, I'm glad all of your quilts got in and they did really well! You did very well with all you entries! Congrats! I haven't a clue how to square up or block a quilt. I'm sure its what you are suppose to do, especially if you enter in shows. Do you wash your quilts before entering? There must be a standard for shows! I love seeing so many of your fabulous quilts all in the same place! It kind of irritates me that they pinned so many labels right onto the quilts, they often cover up so much! I think fractal is my favorite out of this bunch, something about your pastel-but-not-in-any-way-juvenile color scheme really sings to me. Thanks for sharing! Woohoo!! Congratulations on getting all of your quilts into the show, and so terrific that you earned ribbons on several of them. I love so many of your quilts, and it's fun to get them their time in the limelight. Afton? 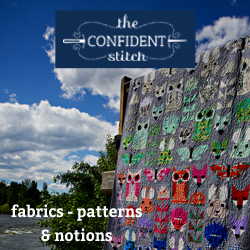 All the Aftons I know are female, and you are one of them: Afton, the fabulous quilter. Congratulations! That is so flipping awesome!! I also recently asked for good tutorials and methods. One commenter mentioned Karen McTavish's website but I haven't been able to find it.